We've finally been having those beautiful, cool autumn days here in New York and it feels like it might actually stick this time. I love this time of year, I look forward to it, but dressing for it can be tricky, especially if you have to wait on a subway platform for more than three minutes. Lately I have been wearing a lot of lightweight layers to help keep myself balanced. This outfit is a perfect example of that; a loose knit sweater, layered with a scarf and leather jacket, skinny ankle jeans, and boots. A look that is quickly becoming my uniform. I paired this cozy lightweight sweater and faded black jeans from Piperlime with my Margot boots, a colorful scarf, and a jacket just in case. It was one of those days where it was warm in the sun but chilly in the shade. And you guessed it, still have absolutely no idea where this scarf came from. The answer did not come to me while in the ladies room at MSG as "Little Lies" echoed through the walls in a that foggy way that accompanies drinking beer through a straw. What a shame. Ha- I love it! Happy birthday to your man, love the outfit, you look lovely! I totally know what you mean about the layers - you go outside and it's crisp and warm, you get on the train and you're about to die from a heat stroke!!! I love your outfit - so perfect and happy belated birthday to your guy! Happy Monday! I am loving this look, and those booties are perfect! This sweater really is perfect! 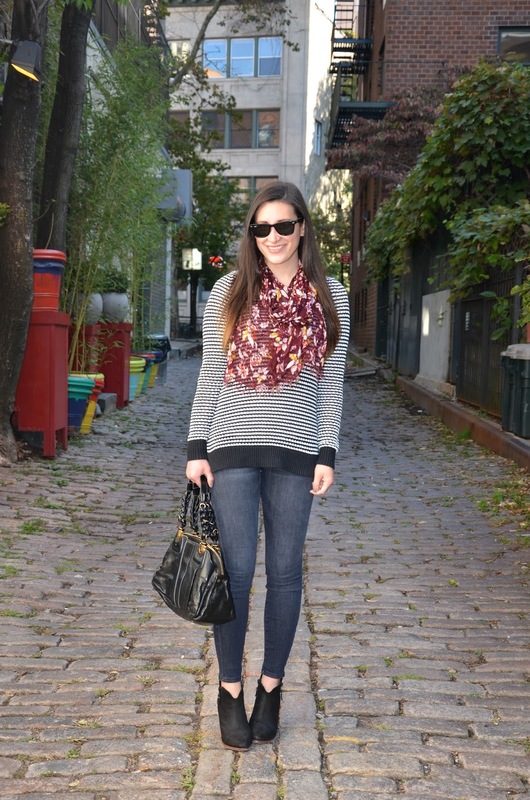 I love the subtle stripes and the scarf is perfect for layering! Ooo I love that sweater, especially paired with your mystery scarf! Love that chunky sweater. Layering is how I survive basically all fall and winter here in Texas! Really cute look. The scarf ties it all together. Your'e so right about the weather here in NY being tricky when it comes to dressing. I'm right there with you with the need for light layers this time of year. That Pim and Larkin sweater is perfect! I love the relaxed feel and I've never met a stripe I didn't like! Love how you paired it with jeans and booties for an easy and effortless look! You mixed prints perfectly! I love this casual, fun look. What an adorable daily uniform. Loving this look! That sweater is amazing and LOVE the floral scarf paired with it. Those booties are perfection too! Super cute sweater! Love this post! 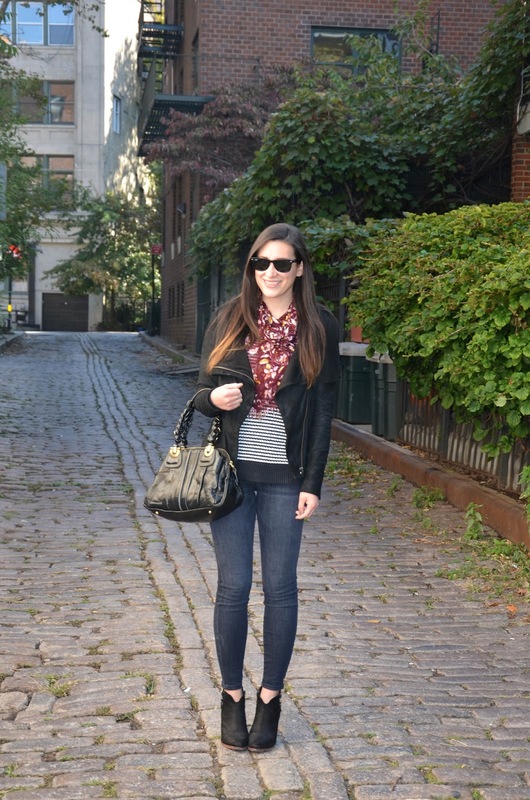 Love this classic fall look, cute shoes! Perfect fall outfit-in LOVE with that sweater...I think the piperlime sale is calling my name. Thanks for sharing! LOVE this look!! So simple and chic... perfect for fall!! Love that scarf too, the color is amazing! Love the contrast of the stripes and floral! :) Very cute! There's that coat again that I love! The scarf has such pretty Fall colors in it! yes, yes. this look is perfection. kthanks. Such a cute sweater! Fabulous layers! Fabulous as always, love. That scarf is amazing! I hear you re: tricky transitional dressing. Happens in ol' KC, too! I love the lightweight layered look. And those jeans! Killer on you, babe.